Photographs of war are often flash points. They encode feelings and arguments far beyond the literal image. The Bush administration came under fire for a blanket prohibition of showing returning coffins from the wars in Iraq and Afghanistan. Sometimes I feel like we as a public need to be hit almost violently with the reality of war. And that's what that photo does. So, I'm really conflicted about it... [War is] ugly. It's violent. It asks tremendous things of troops. And it puts troops in incredible danger ... I have such respect for the family. I can't imagine that pain. And I feel anguish for them. I think about what is that like for that father to look at that photo  I can't imagine. But I want this war to be relevant. And I don't know how you reconcile that. Photographer Nina Berman better understands soldiers and their war by meeting face to face with those who had fought it. With no official list of the wounded to go by, she tracked down newspaper articles on returning vets. She put her photographs of twenty veterans and their stories in her book PURPLE HEARTS. She has added to her series on returned vets � view a slideshow of Berman's work. Bill Moyers has spoken several times with photographer Lori Grinker about her portraits of those who fight and survive wars. In 2002, Lori Grinker talked about her series "After War" on NOW WITH BILL MOYERS. For well over a decade she had been documenting the brutal aftermath of war. "I think that as an American, I never thought I would experience war in my country. And I wanted to know about war from the perspective of these people." The photo to the left is a child soldier from the conflict in Liberia and is entitled "Otis, Playing War." Listen to Lori Grinker narrate photos from her "After War" series. In 2004, Lori Grinker shared more of her indelible images of war. Taken aboard the USNS Comfort, a floating hospital that was stationed in the Gulf to treat coalition forces and injured Iraqis, her photos are a poignant and honest reminder of the deep human suffering of war. In her own words Grinker recounts the stories of her subjects, some of the more than 650 wounded that were treated aboard the ship and of the doctors and nurses who worked to salvage bodies and lives. Grinker says, "It's quite upsetting to see what the war machine does to these human beings. And that's what the pictures represent for me, the human cost of war." 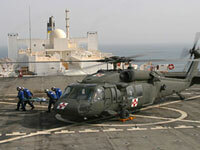 View additional photos from the USNS Comfort. In 2008, Grinker talked again with Bill Moyers about another ramification of war. Grinker traveled to Jordan to document the faces and stories of refugees from the Iraqi conflict. In 2008, according to the United Nations Commission on Refugees, more than 4.2 million Iraqis had left their homes. Of these, some 2.2 million Iraqis are displaced internally, while more than 2 million have fled to neighboring states. The photo to the left was taken in a Jordanian refugee camp and is entitled "Zahar, with her mother and sister." Watch Lori Grinker's interview with Bill Moyers. See additional photos from Grinker's exhibit at the Nina Alexander Gallery. View more of Lori Grinker's photos from around the globe and read her accompanying text on her Web site. Lori Grinker is represented by Contact Press Images. "Family and others protest released photo of Lance Cpl. Joshua Bernard by AP"
An overview of the case. By Lisa Carey, HOUSTON EXAMINAR, September 4, 2009. "AP and the Death of a Marine"
The Associated Press on its decision to distribute the photo of a marine, Lance Cpl. 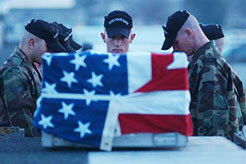 Joshua M. Bernard, dying from wounds received in Afghanistan. "The dying marine: What the hell was the AP thinking?" An editorial critical of the AP's decision from Thomas Ricks, a former WASHINGTON POST correspondent. By Thomas Ricks, FOREIGN POLICY, September 5, 2009. "Column: A tough but correct call on photo of dying Marine"
An editorial supporting the AP's decision. By Mark Prendergast, STARS AND STRIPES, September 6, 2009. "Debate Over Photo Of Lance Cpl. Joshua Bernard"
A debate over using the photo hosted by NATIONAL PUBLIC RADIO, September 8, 2009. "After Further Review: The AP Photo Controversy"
By Jamie McIntyre, LINE OF DEPARTURE, September 7, 2009. The JOURNAL takes a hard look at the state of affairs in ever-divided Afghanistan with McClatchy DC Pentagon correspondent Nancy Youssef. Photo journalists on the course and aftermath of war. From news of the "forgotten front" of Afghanistan to the toll the war is taking on the families of reserve troops here at home, the JOURNAL continues to report on the costs of war that can't be measured in money. Global health specialist and Dartmouth College president Dr. Jim Yong Kim shares his expertise in public health.